I played with Don Richardson at the Maj one year maybe two also before that at same venue with Tony Noorts at least one year. Broadcasts from the Maj every Sat. night on 2ZB. Claridges Cabaret (also Sat night broadcasts), for quite some time. Gigged around with anyone and everyone at other times: Alan Shand, Bill Crowe, Bruce Cook, Garth Young, many others I forget, I wasn't fussy. Also 2YA Radio Band Gigs with Don's outfit also Bill Hoffmeister's. Jazz concerts in the Town Hall all that stuff. 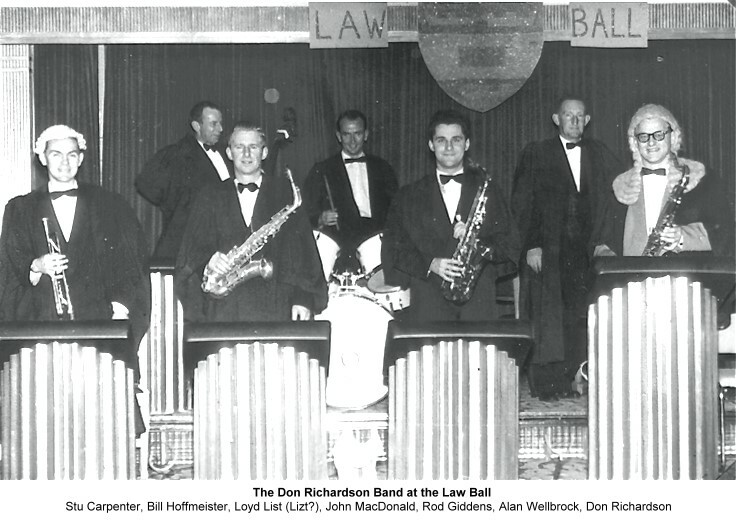 Photo of Don Richardson's Band from the Law Ball at the Maj. l - r, Stew (Stu?) Carpenter, Bill Hoffmeister, Loyd List (Lizt? ), John MacDonald, Rod Giddens (me), Alan Wellbrock, Don Richardson. 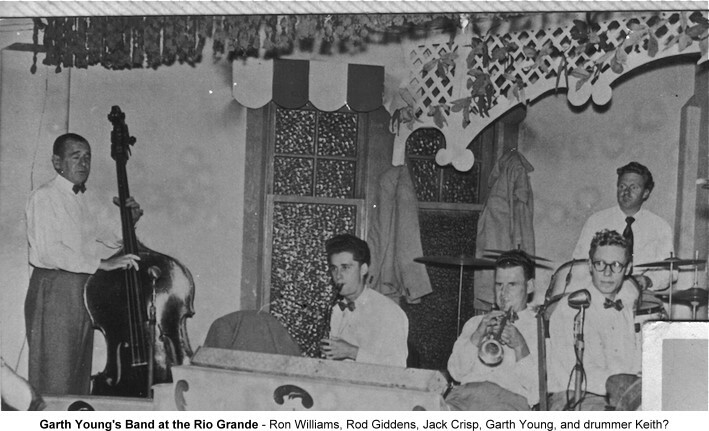 Also played at the Rio Grande with Garth Young's Band for a year or two when I was about 16? (started gigging before I left High School), at the Rio Grande for a long time, which was a Saturday night dance above a gas station in Miramar. Pic is at the Rio with l-r Ron Williams, me, Jack Crisp, Garth Young and drummer Keith? I forget. Also went to Timaru with Don's band playing at Caroline Bay the year after the pic I saw, when Johny Williams was not available. Also in the Territorial Airforce Band. Gave it up some time in the 1960's when I started my own business in Auckland.